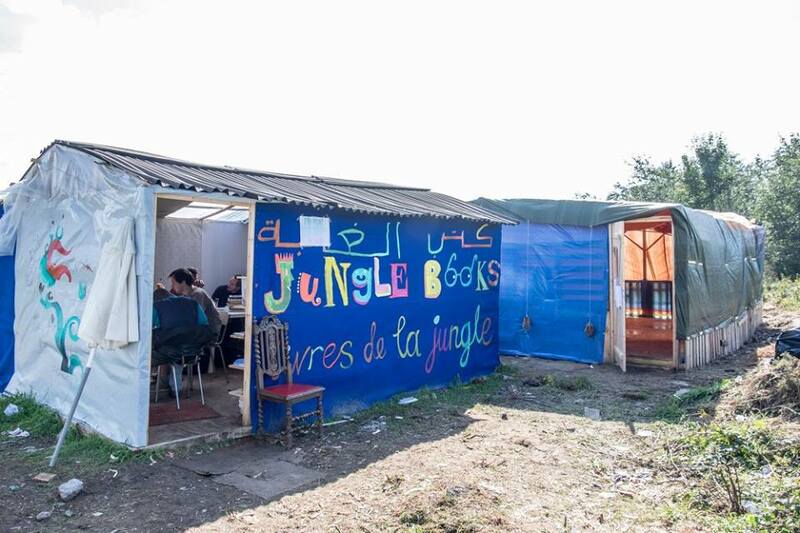 We’re standing in Jungle Books, a small makeshift library in the middle of the notorious Calais Jungle refugee camp. It’s been a bad week for everybody here. Torrential rain for days has turned the bleak landfill site into a flooded swamp, there’s been riots caused by police bulldozing tents which have spilled out of the main encampment, in which people were wounded as teargas and rubber bullets were fired. Earlier, the camp was cordoned off by police in riot gear as we attempted to get in off the main overpass bringing boxes of books and clothes, so now we’ve had to slip in the back way, through dripping thickets, tents listing under saturated tarpaulins, and a slippery path of giant, mud-filled craters. But inside the small, wooden-framed library, built by refugees themselves using tarps stretched over a wooden frame and insulated by spare blankets and duvets, it’s a haven of peace and quiet. Wooden shelves line the walls, stacked with books, papers, lined exercise pads and files. Volumes of books – To Kill A Mocking Bird, The Mysterious Affair at Styles and an anthology of Maupassant short stories to name but three - stand in stacks. It’s also a hive of information. Know Your Asylum Rights! proclaims a small stack of pamphlets on the floor. My Time in Yarl’s Wood reads the title of a pile of self-published books. 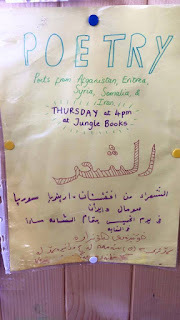 By the door, a small children’s shelf (there are now almost fifty children in the camp, not counting the many hundreds of young teenagers between 14 and 18 which are classed as “men”) boasts my son’s favourite, The Tiger That Came To Tea amongst other children’s classics. For a moment, I feel desperately sad. Earlier that day I had met a 12 year old boy who had travelled on his own from Eritrea. It's a different world here, a world in the middle of developed France which could be a war-torn nation in the Middle East or Africa. Staffed entirely by volunteers, as is most of the Calais camp, Jungle Books has become more than a library, it’s become something of a community centre, where people come and ask for the things they need. Many of them come to ask for English lessons or help with papers, or most commonly warm boots or coats – it’s freezing cold in the wind off the coast even though it’s still only September – and seeing people slipping in the mud wearing only socks and flip-flops is a common sight. Some of the boxes we’ve brought in contain boots and padded jackets which Mary will give to the people who have asked for them. She’s constantly sourcing aid for the people that come to her, – for what good, as she says, are books when people don’t have wood to cook with or shoes to wear? I step outside to collect the rest of the bags and tents that we’ve brought with us. I’m holding a bag of coats when a woman in a ragged jersey approaches me and asks for one. Instinctively I pull it out and give it to her, but it’s too big; I take it away and rummage for another. Instantly the air is suddenly alive with shouts of “Jacket, jacket!” and people start to run towards me. It’s a tense situation – I’ve only a few coats in the bag which have been earmarked for certain people. What do I do? Distribution is a constant problem in the camp – in a situation where over three thousand people need warm clothes and food, there’s never a perfect way to distribute aid. Distribution lines will always run out before the last person is helped, and can often disintegrate into jostling and a scrum, as well as forcing people to take the first thing that is on offer, regardless of whether or not it fits properly. The “personal shopping” system whereby volunteers take note of someone needing an item, going away and collecting it personally for them (as with Jungle Books), is better targeted, but labour-intensive and slower going. The “shop” system, whereby a large tent is used to stock a variety of sizes and colours of clothes and boots, and those in need are allowed in a few at a time to choose their preferred size and colour, is another option, but also very labour intensive. At the same time, too much of the wrong kind of aid (high heeled shoes, etc) is brought in by well-meaning people in guerrilla drops, and left in piles as rubbish. Next door they’re building an arts space but the roof is leaking from the incessant rain and a large puddle has formed on the ground. Seeking a place to calm the growing crowd, we quickly secrete the pile of tents and shoes in there for the moment and the jostling dies down. Panic over, but I've learned my lesson about proper distribution. The industry in the camp – they have built a church, mosques, their own shops, restaurants, a barber’s, and the library - has to be seen to be believed. The dedication of the volunteers too is absolutely remarkable - I ask Mary where she has to get back to, imagining that she lives locally or at the very farthest, in Dover - and am stunned to hear that she lives a long way away in a completely different part of France, so a visit to the camp after work (she's a teacher) takes hundreds of miles in a round trip. The camp has calmed down now after a tense morning with the police, and night is starting to fall. The browsing Iranians sit at a table and chat with some of the volunteers. I notice that one of them has a broken foot wrapped in a supermarket plastic bag, an injury perhaps caused by trying to jump the train to the UK, a dangerous and life-threatening pursuit, but in a system where asylum can only be claimed once you have entered our borders, a necessary one.. Another man, a Sudanese, enters, yawning. “You’ve been up on the trains all night, haven’t you!” they tease him in English. There's plenty of camaraderie here. When I leave, they call after me, only half-joking. "Take me with you!" they call. A boy nearly follows me to the car, holding his hands out, his face full of pleading. It's so, so easy to turn the key in the ignition and drive off. It's not easy at all to forget how disgusted and sick it makes me feel, to live in a world where things like this are possible. Fast forward three weeks since I visited, and Jungle Books has grown apace. 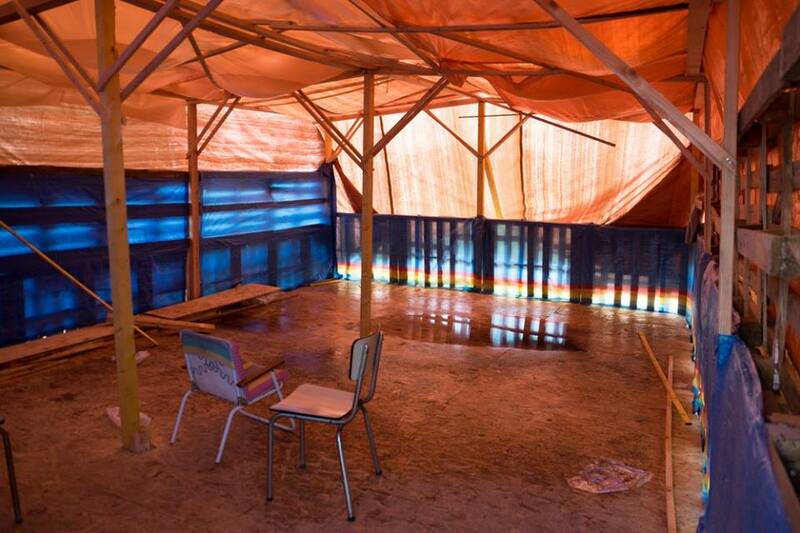 The arts space has now been finished and music lessons and poetry nights have taken place. When I speak with Mary by phone today for an update she is upbeat. 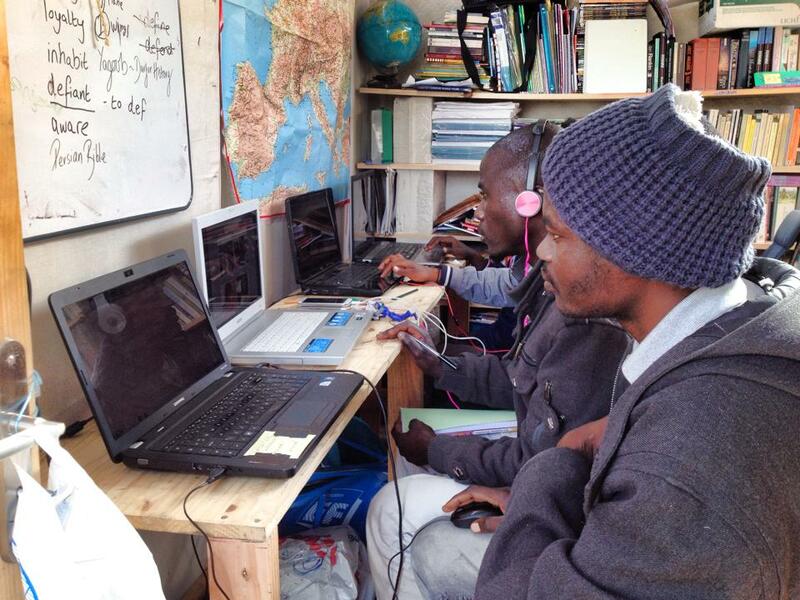 “We’ve got some laptops in now, with Rosetta Stone installed (language learning) and working on implementing a router for internet. 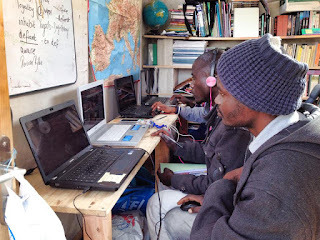 Once we've got internet we can get some more computers with wifi to give people a chance to learn and get information." 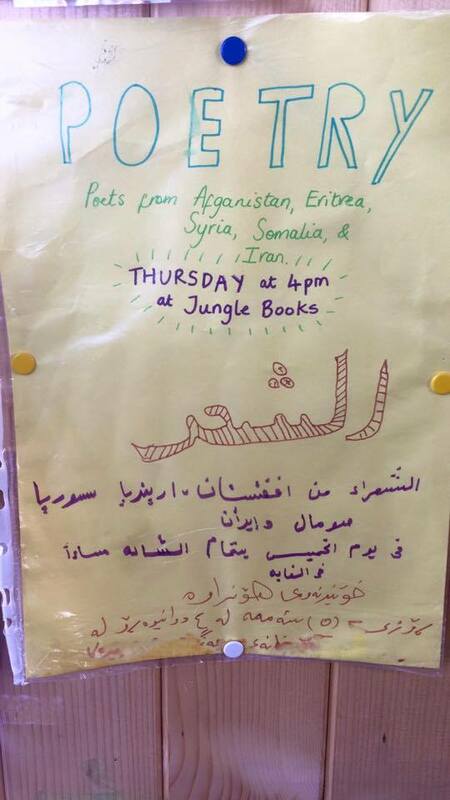 Since my visit, the arts centre has been re-roofed and insulated, and they have their own Facebook page (Jungle Books Library Calais) Mary is also trying to implement a crowdfunder to develop the arts centre into a safe space for the growing number of kids in the camp, to give them a normal place to be, if only for a time. A library like any other then - in so many ways - and not like any other too. The amazing amount of work and ingenuity that has gone into making a thriving place to give people hope and dignity can only be applauded. For if Britain one day turned into a war-torn country and we had to make the difficult journey to Europe ourselves, I can only hope that we would demonstrate a shred of the courage and resourcefulness that they already have. If you'd like to help the Jungle Books grow and develop, please help donate to and promote their crowdfunder and follow their Facebook page. If you want to go to the camp with supplies - please don't just turn up and attempt your own distribution which can cause waste and chaos, complete the Calais Aid Warehouse form online first to make sure you have appropriate aid and the date that it will be expected. Thank you for this update and good, clear information on practical ways to help. Thanks Joan and Pippa - there are so many good people working in the camps to try to make life better, so I'm trying to let people know of ways they can help - if you can share this article around your networks it would be awesome! Happy to donate, what brave, good work you're doing. Thank you. Remarkable, the work that is being done. Mary is my sister and I can't tell you how Incredibly proud I am of her and her friend who are doing so much to help these people in a really awful situation. Thank you for writing such a positive and informative blog, I hope a lot of people get to see it. It’s also good to see positive comments (not always the case). This is an amazing achievement. Thank you for writing about it. Very humbling that in this atmosphere of distress people still seek out books. The Italians are also doing amazing work at Lampadusa. It reminds me of the informal settlements in South Africa where libraries are housed in shipping containers. Thank you so much for this post. I will go to their Facebook page and see what I can do - it is so inspiring to see people actually making a difference and I also think it was wonderful of you to go and report back on it. Thank you. Thanks so much for all your comments everyone! - it was a really inspiring and humbling experience to meet the people working so tirelessly in the camps. Please feel free to share the information everywhere you think it might be useful. Ruth, your sister is a wonderful person and she's doing a great job. I wish you both well!